A drive on the Hwy. 129 Tail of the Dragon is always a spectacular experience. If you are coming from Robbinsville, NC this part of Hwy. 129 is a few miles past the TVA Cheoah Development in Tennessee. Driving this road is a test of skill. It is not for people who are faint of heart, have heart conditions or who get car sick easily. The Hwy. 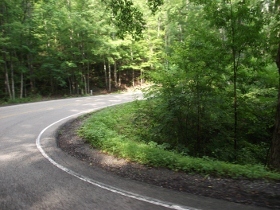 129 Tail of the Dragon has 318 switchback curves and a mere 11 miles to drive them in. The road earned its nickname because the map layout resembles a dragon and tail. It's a fun, free wheeling sort of drive but is definitely not for everyone. Etiquette demands that drivers of slower vehicles will pull over to let other cars pass. It's not just courtesy, it's a safety factor. Passersby will wave their thanks in return. 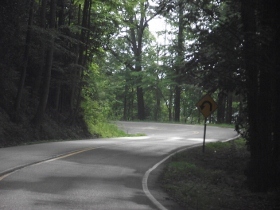 Last time we were on the Hwy 129 Tail of the Dragon Hubby drove the road. This time it was my turn and I couldn't wait. All my college age daughter could do was sit down, buckle up and yell 'Whee' at all the right times. Hubby, in turn, either held his camera or the dash board. I figured as long as he was buckled in we were ok for the trip. Deceptively, the Tail of the Dragon begins and ends calmly enough. Then Hwy 129 builds into the mountain curves that you see here. There is an overlook on the drive where you can admire the scenery. It's has what may be the world's most unique guard rail. The guard rail is decorated with stickers and bumper stickers of those who have tackled the road before. 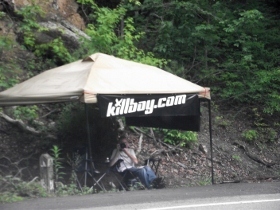 We also passed the KillBoy photographer. Unfortunately we didn't know that our picture was about to be taken. Sorry about that, KillBoy. I'll have to drive the Hwy 129 Dragon again so we can smile and wave at you. The road trip was all that it's cracked up to be and more. Remember, it is up to you to keep your vehicle under control at all times. The trick to driving it safely is to watch your speed and keep an sharp eye out for others. You may see animals or the occasional pedestrian so be prepared to react quickly. The pulloffs are there for a reason. Use them. If you get tired or need a break, stop. Deals Gap Motorcycle Resort is open from March 1 through late November. It is a gas station, store, grill and pub. Best of all, it's also a good place to stretch your legs and chat with other people. We were at the end of our 11 mile journey before we knew it. The curves were but a memory. Ahead of us the road ahead became level and straight. In a few more miles we were headed toward the town of Vonore, Tennessee.